Things are back to normal here, although I have a boat load of laundry to do and more house work than I want to think about before the holiday weekend. Debbie is back at home in Arizona after about 12 days here in California. I am quite sure she was happy to get on that plane to go home to her family. Especially since I made her watch one episode of "The Closer" every night we were here at home. I can't seem to get enough of that show and apparently it's been on for 6 years so I have a lot to catch up on. We had a terrific time teaching at both Pocketful of Treasures in Clovis and Art Inspired Studios in Brentwood. It was like 'old home week' in Clovis...so many ladies that come every time we teach. Lots of laughter and fun with that group. And Art Inspired Studios... it was our first time to teach in Northern Calif. and we loved every minute of it, even the 4 1/2 hour drive up the coast. Deb is going to do a recap on teaching on Friday so I won't go into here other than to say "thanks" to all the ladies that came for the classes. I wanted to answer some questions here today about some of the stamps used in the two classes we are teaching, Abundance and My Ten. Everyone has been asking about a number set that is used to stamp the large round circles in the My Ten kit. The numbers are made by a company called Ma Vinci's Reliquary. 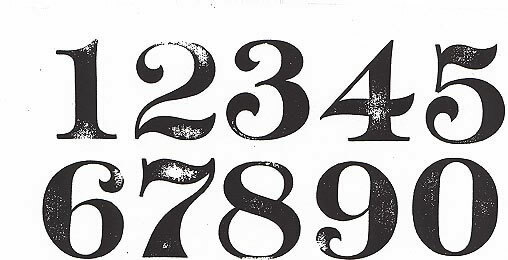 The set is called A&P Numbers (small-1 1/4" tall) and are $8.00 on sale for $2.00 a sheet of unmounted rubber!! I admit, the website is not easy to navigate but the prices and designs are good. If you have never worked with unmounted rubber before it may sound daunting, but it's not. It just takes a bit of time to mount and cut out, but it's worth it to get a great set of large numbers like these. To get the images ready for use, you will need a product called EZ Mount or Cling Cushion. Both are designed to be adhered to the backs of unmounted rubber stamps. No more rubber cement and wood pieces my dad cut for me in the garage! Basically one side is the adhesive for the red rubber and the other is a non-adhesive which will hold the stamp to acrylic block for stamping. 1. Peel the liner from the adhesive side and mount to your rubber stamp. 2. Trim the excess rubber and foam close to the design. 3. Remove liner from the other side, which will expose the static cling. 4. Place on an acrylic block. Now your ready to stamp. How about a great alphabet? Love this one called Antique RSM alpha. It comes in 1" and 1 1/2". The other stamp people were asking about is this Harlequin stamp from this Tim Holtz set. We first used it in the Advent Calendar (swoon) and continue to use it an many classes. I first bought mine at Michaels but I do not know if they still carry the set. 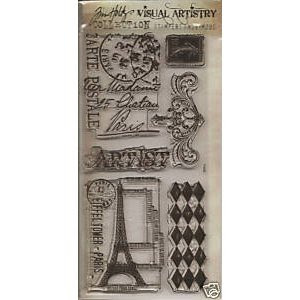 I do know that if you go to Ebay and type in "Tim Holtz French Market", a bunch will come up for sale. Easy Button. 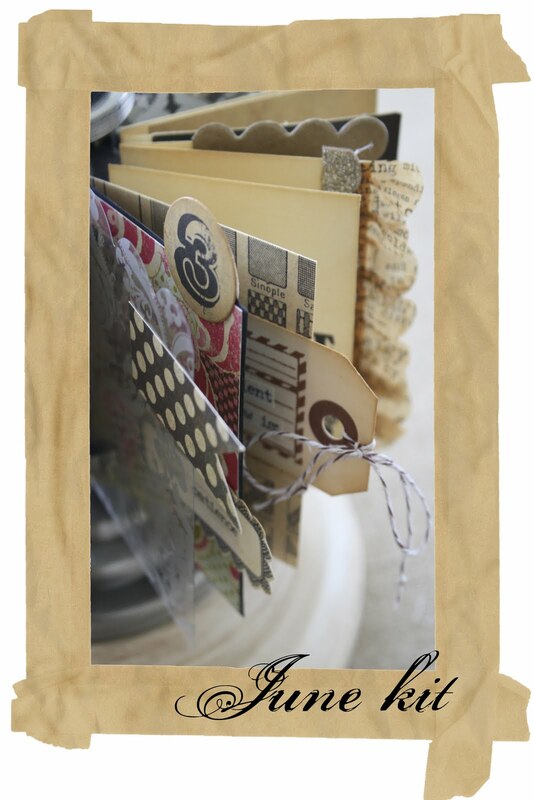 Before I go, I mentioned last week that we have a new kit coming to the Etsy shop in June. It's almost finished so I thought we would give you a sneak peak. Yes, you may recognize that it is a 7gypsies ATC spinner...but this one has a twist (no pun intended), you might just be able to see it in the picture below. We will reveal the complete kit and price the fist week of June. Kits will go on sale June 17th with shipping around the 20th. If you are interested in pre-sale, just send us an email to contact@2gypsygirls.com. We will send you a reminder email the week before the kits go on sale in the Etsy shop. At that time you can pre-order your kit before they go into the public Etsy shop. PS) Those who posted a comment about the kit are already on the pre-sale list; Becky, Heidi, Robin (of course), Julie, and Judy. Thanks girls! This looks fabulous! I can't wait to see the rest. WOW! That kit looks fabulous! And I must know where you got the masking tape element! I've got to get me one of those. live.e designs - Tape it Up. Search by designer, then scroll way back since they are some of her first designs. You are not alone! We watch The Closer every night also. Thanks for all the stamp info. Thanks so much you both are gems and I can't wait. I wish you would come out to the east coast to teach, I would love to meet both of you. Glad you both made it home safely. What a great time I had at the class in Brentwood - you both are so talented, organized, super nice and generous. It was a thrill to meet you both and can't wait until you come back again. Love the June kit and will definitely pre-order. Love the peek! Very interesting as always! And I love, love, love the stamps shown here. Off to try and figure out that website and get me some!